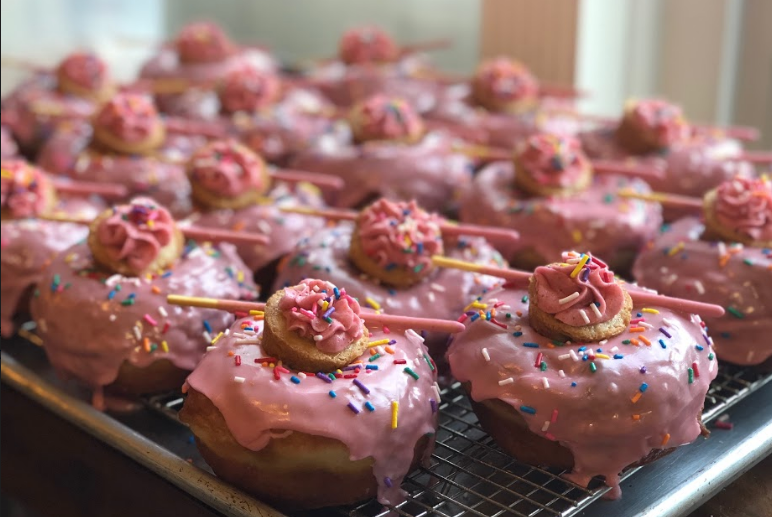 Our donuts are truly something special and we spent some quality time getting them up to snuff before bringing them to you here in The City Beautiful. They come in all sorts of shapes, sizes, and flavors. We hand-roll and decorate all of our donuts, make almost all toppings from scratch, and offer vegan and flourless options, keeping the "craft" in craft donuts like no one else around. Below is a gallery of our standard flavors. The donuts pictured are brioche, a raised and enriched dough. We offer almost all of these flavors as vegan, flourless, or vegan-flourless. And let's not forget the sour cream old fashioned we make too, which are also available as regular, vegan, flourless, and vegan-flourless! But how do you get your hands on some donuts since we don’t have a brick-and-mortar location? We have a couple of private order options here on our site. But for an a la carte experience, keep an eye on our calendar for upcoming pop-ups around town. We’re regularly at Kelly’s Homemade Ice Cream, Orlando Brewing, New General, The Heavy, and The Greenery Creamery.